Perhaps the most commonly kept fish of all time is the goldfish, Carassius auratus (auratus meaning "covered with gold"). Many a hobbyist has started fishkeeping by winning a goldfish at a fair after throwing a ping-pong ball into a fishbowl (luckily, this practice has been outlawed in many places). Indeed, the goldfish you may have seen at a carnival game have a long and royal lineage. It goes back over 1375 years to the T'ang dynasty in China (618-907 A.D.), where they were kept in ponds or small bowls (goldfish and their relative, the koi, are best viewed from above). During the 15th century, goldfish were introduced to Japan, where keepers continued to selectively breed these fish for color, body shape and finnage. Somewhere around the 18th century, the goldfish was introduced into Europe and later into the American hobby. The most common goldfish variety is the Comet, a long, slender plain-looking fish (and a far cry from the many varieties available to hobbyists). Due to selective breeding and accidental mutations, the common goldfish has been transformed into the 100+ varieties we see today. Comets can vary in color from pale white to gold to blue, to black, or a mix of colors (called the shubunkin). Selective breeding has turned the slender, single-tailed Comet into the round-bodied, colorful, multi-tailed fish we are all familiar with. Oranda: A short, round-bodied fish with a double tail. Notable on these fish is the head growth, which can cover most of the head! An exception to this is the red cap oranda, which is considered a "high head" Oranda. Lionhead: This variety has a rectangular body with a smaller double tail and no dorsal fin. 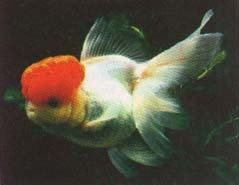 Like the Oranda, the head growth can cover most of the head. Ranchu: This variety has an egg shaped body, double tail, and no dorsal fin. This type has less head growth than other types. Along with the variation in finnage and body types, goldfish breeders have also selected for the way the eyes, and even the skin, look. There are many, many more varieties to choose from, and to list them all would fill the pages of this magazine. Unfortunately, because goldfish are so popular, they are often abused. Stuffed into small, unheated, unaerated, unfiltered bowls, the lifespan of these fishes can usually be measured in days or weeks. Goldfish can actually live 10 to 20 years if kept properly. Since they get fairly large (8" to 24", depending upon the type), a good-sized tank is required. Small goldfish do not stay small for long, and a 30-gallon tank would be minimum for one or two adult specimens. Whatever you do, don't overcrowd your goldfish. Goldfish produce a large amount of waste, so good filtration, such as an outside power filter or canister filter, is a must. Poor water quality can cause blood-streaks in the fins, which can become bacterial fin rot. Twenty-five percent monthly water changes are advised. Goldfish are cool-water fish and prefer a water temperature in the 55-degree to 70-degree range. (This is not to say that they will not tolerate warmer water, but they will not be at their best.) In fact, a heater will help to maintain a steady temperature, which is important since a chronic drop and/or rise in temperature can stress your goldfish and cause an outbreak of white spot disease (commonly called "Ich"). Maintain a slightly alkaline pH and your goldfish will be appreciative. Feeding is not a problem with these fish, as they will eat almost anything. But you may want to give them a diet high in greens. Fresh veggies, like peas and kale, make great treats. While goldfish have been around for over a thousand years, there is always much more we can learn about them. A Google search will turn up a lot of information that will help you be a successful goldfish hobbyist, or feel free to write me at the address below.